Republican presidential candidate, former Massachusetts Gov. Mitt Romney \arrives to deliver a foreign policy speech at Virginia Military Institute in Lexington, Va., Monday, Oct. 8, 2012. Updated at 12:20 p.m. ET: Mitt Romney accused President Barack Obama of leading a rudderless foreign policy, saying Monday that the threat of conflict in the Middle East is greater than it was four years ago. 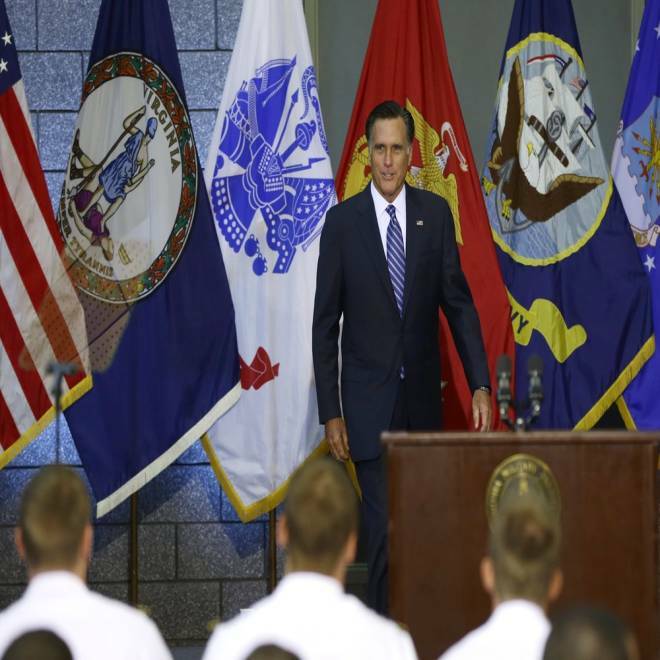 The Republican presidential nominee delivered a major policy address at the Virginia Military Institute, which was intended to distinguish Romney from Obama on questions of foreign policy, while also casting Romney as a steady, presidential and plausible commander-in-chief for voters. Recommended: First Thoughts: Has the race changed? The speech focused heavily on upheaval in the Middle East — the attack on a U.S. diplomatic mission in Libya, popular uprisings in Syria and Egypt, the Iranian nuclear program and America's relationship with Israel — to level the charge that Obama had chosen to "lead from behind" as president. During a campaign speech at the Virginia Military Institute, GOP presidential candidate Mitt Romney outlined his plan for easing tension in the Middle East, preventing Iran from acquiring nuclear weapons capability and a successful transition of power in Afghanistan. "The president is fond of saying that 'the tide of war is receding.' And I want to believe him as much as anyone," Romney said. "But when we look at the Middle East today … it is clear that the risk of conflict in the region is higher now than when the president took office." Romney essentially argued that, in most instances, Obama had failed to project a clear and coherent American policy abroad. The GOP presidential hopeful suggested that he would use U.S. power with greater clarity, taking a tougher tack versus Iran and working to support allied forces in Syria, where the Assad regime has launched assaults on rebels that have left thousands dead. Much of the speech dealt with the recent outbreak of violence in Libya, where a siege on a U.S. consulate — waged apparently by terrorists — left four Americans dead, including U.S. Ambassador Christopher Stevens. 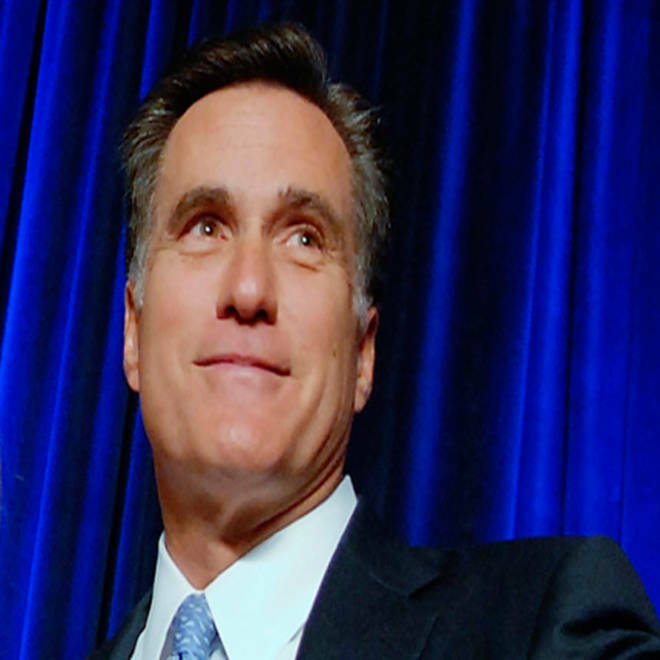 Republican presidential candidate Mitt Romney is set to deliver a major foreign policy speech today, but as NBC's Mark Murray and Domenico Montanaro report, the policies Romney will propose sound similar to those pursued by President Obama. Romney said those attacks were "likely the work of forces affiliated with those that attacked our homeland on Sept. 11, 2001," reflecting the emerging admission by the Obama administration that the Libya incident was a terrorist attack, rather than a spontaneous protest connected to a web video about Islam, as had originally been thought. Romney's handling of the immediate aftermath of the Benghazi attack, though, had partly prompted his decision to deliver such a broad-reaching foreign policy address as today's. The candidate earlier had charged the administration with, essentially, siding with the attackers on the U.S. consulate — an argument that was labeled by critics as capricious, since it came just hours after Stevens' death. "I also believe the administration was wrong to stand by a statement sympathizing with those who had breached our embassy in Egypt, instead of condemning their actions," Romney said at the time. "It’s never too early for the United States government to condemn attacks on Americans and to defend our values." Today, Romney placed blame for the attacks "solely" with those who had launched them, but argued that Obama had nonetheless been asleep at the wheel throughout the crisis. "It is the responsibility of our president to use America’s great power to shape history — not to lead from behind, leaving our destiny at the mercy of events," Romney said. "Unfortunately, that is exactly where we find ourselves in the Middle East under President Obama." That theme echoed throughout Romney's remarks, which included a vow to tighten sanctions against Iran's nuclear program and reverse a set of automatic spending cuts — which would fall heavily on the defense budget — set to take place at the beginning of 2013, barring action by Congress. Romney also called for a closer relationship between the U.S. and Israel, a hallmark of the Republican nominee's campaign speeches, along with expanded free-trade pacts in the Middle East and beyond. The former Massachusetts governor also said he would act more forcefully to encourage popular uprisings in Syria and Egypt. Romney said he would "identify and organize those members of the opposition who share our values" in Syria, and arm them. In Egypt, Romney said he would try to influence that government's development to support democracy and their peace treaty with Israel. Monday's stagecraft, though, was essentially an effort to offer up Romney as a reasonable alternative to Obama as a world leader, and distinguish the two candidates more meaningfully. There were details, though, that were absent from Romney's speech; he didn't outline the standard by which he would authorize more sanctions or military action versus Iran. And while Romney called Obama's decision to withdraw the last "surge" troops from Afghanistan last month a "politically timed retreat," Romney would only have kept those troops there a few months longer, through the height of the fighting season. Obama enjoys an advantage over Romney on both the question of which candidate would be a better commander-in-chief and which candidate voters trust to better manage foreign policy. Forty-seven percent of voters said in last week's NBC News-Wall Street Journal poll that Obama would be a better commander in chief; 39 percent of registered voters preferred Romney. On the question of who would best handle foreign policy, Obama led 46 to 40 percent. But there are additional signs that Obama faces vulnerabilities. Americans were split, 46 to 45 percent, in disapproving of the president's handling of the situation in Egypt, Libya and other Arab countries that are suffering from unrest. "We just watched what leadership looks like," said Wisconsin Rep. Paul Ryan, the Republican vice presidential nominee, in Ohio shortly after Romney's remarks concluded. Still, the election is expect to focus primarily on issues of the economy, while foreign policy takes a backseat to more dominant pocketbook issues. Foreign policy and national security strategy, though, will each be litigated further over the course of the campaign. One of the two remaining debates between Obama and Romney will be mostly dedicated to that subject, and this Thursday's vice presidential debate will pit Ryan — whose expertise rests on budgetary issues, not foreign policy — against Vice President Joe Biden, a former chairman of the Senate Foreign Relations Committee.